Clevelanders LOVE their burgers! In the “Land” there are many places where you can get your fix for one of America’s all time favorites, the hamburger. There are numerous ways we love our burgers. With cheese, no cheese, bleu cheese, mushrooms, onion rings, medium rare, well done, with a hard-boiled egg, with french fries, etc. In Cleveland there is no limits on what we will put on a hamburger. One of many aspects of a great burger is that it is Made to Order and the ingredients are fresh and of high quality. Many of these places are a visual adventure as the atmosphere of these establishments are almost as good as the food they serve. All of these burger joints listed here are committed to the best ingredients and the customization of your experience once the burger hits your mouth. 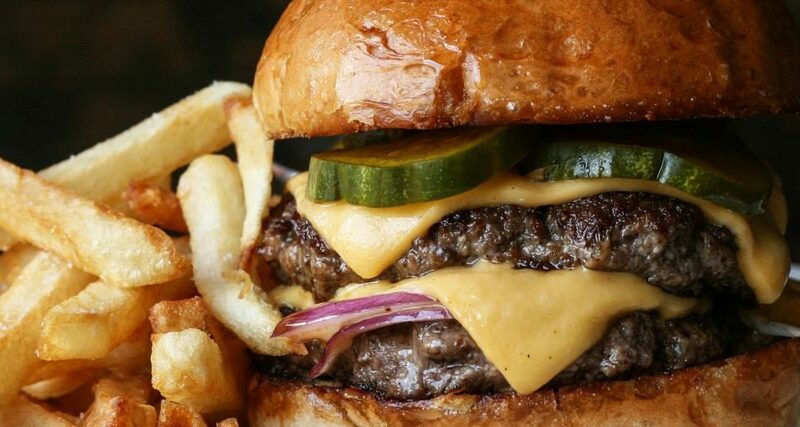 To help hamburger enthusiasts find a new place to clog your arteries, we have compiled a citywide directory of Cleveland’s Best Places to grab a burger. You may want to unbuckle your belt for this. Voted Best Burgers in America 4x (2010-2012, 2014), Celebrity chef Michael Symon has burgers down to a sweet science at B-Spot. Now with 7 locations in Ohio, B-Spot is a fan favorite at Quicken Loans Arena and First Energy Stadium. Some favorites are the Lola Burger and the New Jack City. The Whiskey Milkshakes are an added bonus. With locations by Playhouse Square and Inside Progressive Field, Dynomite Burgers is one of the the city’s rising stars when it comes to burgers. Some of the more intriguing selections are the Parallax, Cow and Hubbard and the Kafeteria burgers. Downtown Cleveland just keeps getting cooler and cooler and no, Jimmy Walker does not work there. While Nano Brew is well known for its wide selection of craft beers, Nano Brew also has award-winning burgers and is one of the few places where you can get a Peanut Butter and Jelly Sandwich! The Acid Drip was voted Most Unique Burger in Cleveland. Some other favorites are the Daily, Beet It and the Taco Tuesday. One of The Flats most popular locales, Bar Louie has some of Cleveland’s tastiest burgers. Some of the most notable include the Spiked Bulleit Bourbon Burger, the Phillyburger and the Backyard BBQ Burger. All of these burgers look like triple bypass surgeries on buns, which makes it even better. Seriously, these burgers are huge. New to Cleveland, Wahlburger’s is one of the fastest growing burger chains in America. Some of the top selections are the Fiesta Burger, the O.F.D. (Originally From Dorchestah) and the Our Burger. 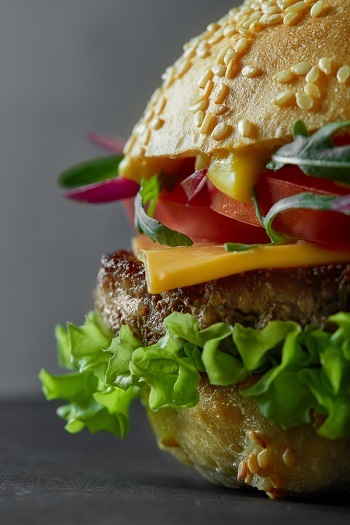 Wahlburger’s commitment to fresh ingredients and great service has helped their meteoric growth. Originally one of Akron’s most legendary burger joints, Swenson’s has a location in Seven Hills. It is an old school drive up burger place where the staff runs out to your car and takes your order. They even have the metal tray that attaches to your car door. Some of their staples include The Galley Boy, The Triple Cheeseburg and the Fried Bologna(Yes Fried Bologna)! They also have a wide array of milkshakes and drinks. Some flavors are pineapple peach and one of the mosyt iconic drinks in the Midwest is The California…go figure! Look, we know that a hot dog is not a burger but so what! In addition to an impressive list of signature hot dogs like the Hillbilly Dog and the Porky Pig Dog, The Hot Dog Diner has a formidable list of burgers. Some mouth-watering offerings include the Pierogi Burger, Paradise Burger and the Farmer Dave Burger. The hot dogs are great too. With one of the most extensive bottled beer collections, Buckeye Beer Engine is also a Lakewood bastion of burgers. Every Saturday and Sunday they have a Burger Brunch. A few of the top choices include the 76 Burger, the Cyclops, The Westside and the Smoked Brisket Burger. Buckeye Beer Engine is a great reason to get out the house on a Sunday morning…besides church and a Browns game. One of Lakewood’s finest “buggar” joints, Jammy has a diverse array of burgers that will please your palate. The Remodeled Detroit, The Smokey and the Chicken-n-Waffle are few of the many burgers to choose from. Jammys has Sunday Brunch every week and their drink specials make for a great time. Listed as one of the “20 Lakewood Restaurants Should have Tried by Now” by Cleveland Scene, Deagan’s has been known for its high quality cuisine. Thursday is Burger and Beer Night where you can have a burger and a beer for $10. The DKB Burger is a favorite. One of America’s fastest growing burger chains, Five Guys has some of the best burgers in the area. From the peanuts, Shakes and fries, Five Guys makes every burger Made to Order. One of the last classic drive up burger places, Sonic has a plethora of choices including delicious burgers. Their commercials are hilarious and the food is pretty good too. One of the freshest restaurant chains in the area, B2B Burgers 2 Beer has delectable offerings on their menu. Some of their burgers include The Breakfast, Hot and Bothered, The Side Chick and The Luther. A long time favorite in Mayfield Heights, The Fox and Hound has an eye-popping burger selection. The Voodoo Burger, Carolina Burger, The Craft Burger and the Ranch Hand Burger have been filling bellies on this side of town for years. This and the many bar games and pool tables has solidified The Fox and Hound as one of the most iconic pubs in the city and top pick for fantasy football draft parties. The Jerusalem Grill has been a South Euclid favorite. Yes, You can have an outstanding kosher burger. Some include the Cowboy Burger, The Breakfast Burger and the Ohio Burger. They also have many Asian and Middle Eastern inspired dishes. Closed on Saturdays for the Sabbath. OIC (Only in Cleveland) can a grilled cheese enthusiast create a chain of wildly successful burger joints. Melt is one of the newest restaurants in the city. This is due to is phenomenal burgers, signature soups, appetizers and entrees. Many of the sandwiches at Melt are technically not hamburgers but Clevelanders never were much about technicalities. Some of the fan favorites include the Lake Erie Monster, the Good Burger, The Fried Father, Cuban War Pig, Melt Cheeseburger and the Big Fat Gyro. One of Cleveland Height’s newest and beloved burger spots is Fresh and Meaty Burgers. Like many of the aforementioned burger joints, you can have your food delivered thru Skip The Dishes. Some of the Heights’ favorites include the Royal Burger, Grandma Burger, Double Meaty, Taco Burger and the King Burger. Tommy’s menu is a perfect reflection of Cleveland Heights, diverse, multi-faceted and forward thinking. 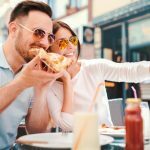 From falafel to pizza to cheeseburgers, Tommy’s has a almost everything humans eat in the Cleveland Area. That being said, their burgers are some of the city’s best. The Curt Burger, Sharpy and Turkey Burger are some of the plethora of entrees that are available. The Larchmere Tavern is known for its eclectic cuisine. From Filets to Jambalaya, the last thing you would expect is a tasty burger. Like Cleveland itself, The Larchmere Tavern on the low has some scrumptious burgers along with a remarkable wine list. 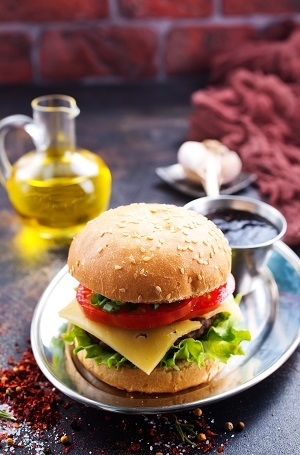 Some recommended burgers include the Larchmere Tavern Burger, the Western Burger and the NY Steak Strip Sandwich. So if you are trying to impress your date, she can have the Sandy’s Seafood Newburg and you can opt for a burger and everyone wins. Since 1939 The Academy Tavern has been a Cleveland landmark for food and drinks. In addition to your traditional bar eats and treats, The Academy makes a good hamburger. The Santa Fe and The Academy Burger are go-to choices to go with your beer while you watch the game. One of the finest burger establishments in the city, Burger Fresh has a build-a-burger option as well as signature sandwiches. The California, All-American and ‘Shroom Burger are some of the many to choose from. There is also a Salmon burger if you are looking to be health-conscious. For many years, Scorcher’s has been a neighborhood fixture in Bedford Heights. Patrons have come to enjoy a game of volleyball and then have one of dozens of beers and cocktails after their game is over. Scorcher’s has some awesome burgers and weekly drink specials. The Ragin’ Cajun, Patty Melt and the Brickyard Burger are some of the tasty choices you can enjoy at Scorcher’s. Yes, We know Mr. Hero is a sub shop but how could we leave off the Romanburger which is a “Godlike” sandwich off of a Best of Cleveland Burger list of any sort. After all it is one of many Cleveland-based sandwiches that is the Cleveland Culinary Hall of Fame with The Panini Overstuffed Sandwich and the Polish Boy. For this reason we are putting the Romanburger on the list. I would hope not too many Clevelanders would have an issue with this. Besides the waffle fries and cheese sauce is too good! The Cleveland legend has locations in Euclid and Willoughby. In addition to the classic panini overstuffed sandwich, Panini’s is known for its delicious burgers. The Sicilian andThe Panini Boy are some of the best burgers anywhere and this has helped fuel Panini’s growth in Ohio and in other states. Red Robin is one of America’s most loved and respect burger chains. Many up and coming burger joints have variations of many of their burgers such as the Bleu Ribbon and the Royal Robin. Other like the Banzai Burger, The Wedgie and the Whisky River BBQ burger are unmistakably Red Robin’s. Their bottomless fires, Baileys Irish Cream Shakes and entrees make it a Willoughby favorite. One of Willoughby’s most popular bar and grills, Firehouse has a fine selection of burgers. The restaurant is an old Willoughby Hills Firehouse, which obviously goes great with the theme. Some of the signature burgers are The Firehouse, The 5 Alarm, the Original BG and the Potato Pancake. The Firehouse has an extensive menu and large selection of beers.